(Reuters) - Appealing to working families in her first major campaign speech, U.S. Democratic presidential candidate Hillary Clinton said on Saturday she would rewrite the U.S. tax code if she is elected so that it rewards hard work, and not quick equities trades or money stashed away overseas. She also pledged to establish a national infrastructure bank financed by bonds, an idea championed by President Barack Obama, a fellow Democrat. 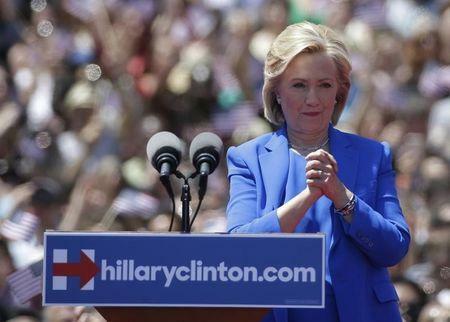 In her speech at Roosevelt Island in New York, the first major address in her run for the White House in 2016, Clinton appealed to the liberal wing of her party. She said she would support a constitutional amendment to overturn the Supreme Court decision lifting on caps on campaign funding known as Citizens United.